Here's my short and sweet review: I love this book. 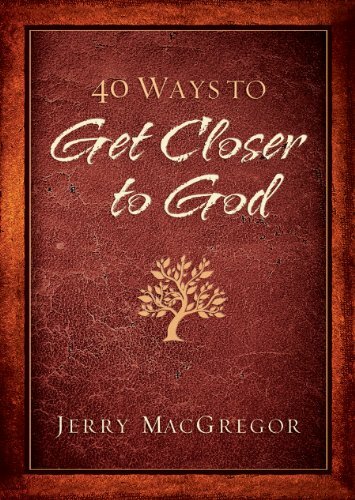 If you are looking for some practical ways to work on your relationship with God, I definitely recommend this book. There are a lot of really great suggestions for things to try in here that you may have already thought of before, but this book really makes you take that step and actually do those things. And I love that Jerry MacGregor doesn't waste your time. He tells you flat out in his message to the readers at the very beginning of the book that he's no saint, that he doesn't always (or even often) get things right, but these are steps that he's found have worked for him. They're not things that he's never done, he's done all of them at one point or another. And he doesn't waste any time making you think that any of it will be easy either. He tells you flat out that the things in this book are work. That they require time and commitment. I also love the variety of different ways to get closer to God. There are some things that you can put down the book and do right then and there, and there are also things that take a decent amount of work and planning to do. Seriously, I really recommend getting this book to use as a devotional or to study with friends, I think that it would make a great book study. Overall great book/resource!